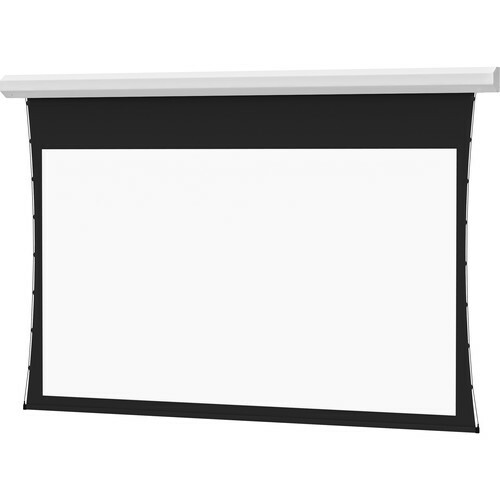 The Dalite 58 x 104" Tensioned Cosmopolitan Electrol Front Projection Screen is ideal for applications where a recessed installation is not desired or feasible. The tab guide cable system maintains even lateral tension to hold surface flat while custom slat bar with added weight maintains vertical tension. Its handsome black textured case blends with any decor. Dalite offers projection screens for all scenarios - business, education or social. Manual or electric, large or small, wall, ceiling or tripod style - Dalite has a style to suit everyone's needs. Box Dimensions (LxWxH) 134.0 x 13.0 x 10.0"